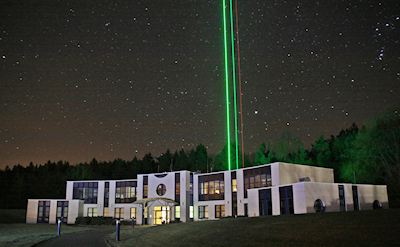 Atmospheric research uses pulsed laser beams to measure temperature and wind speed along the beams by measuring the Doppler shifted and backscattered light at 100 km height in the atmosphere. The returning light signals are very weak and can be blocked by sunlight, but The Leibniz Institute for Atmospheric Physics (IAP) has solved this problem: they developed the world’s only portable instrument that can be used during the daytime and it has already provided new insights into Antarctic atmospheric conditions. This new generation of compact and reliable systems uses a novel, diode-pumped laser and, at its heart, are a Spectrum Instrumentation Arbitrary Waveform Generator (AWG) and two Digitizers that provide the extremely high speed, sensitivity and real-time capability required. The measuring technique is called Doppler resonance LIDAR as the light is backscattered by tuning the laser precisely to a resonance transition of a metal atom. The backscattered signals are extremely weak (single photons per laser pulse) and are almost completely drowned out by solar radiation during the day. The difference between night and day measurements is that there is 100,000,000 times more background noise during the day from the sun. Understanding temperature distributions in the atmosphere at altitudes between 80 and 110 km, called the MLT (Mesosphere and lower Thermosphere), is crucial for performing numerical simulations of the Earth’s climate. One well-established approach to provide such data is to measure the Doppler broadened line width of metal atoms, e.g. of the potassium resonance line at 770 nm and of the iron resonance line at 372 nm or 386 nm, by means of resonance LIDAR systems using pulsed lasers. Until now, these lasers have used flashlamp-pumps, but this project is the first to develop a novel laser system using a highly efficient, tunable, diode-pumped, alexandrite laser that is better able to cope with rough environmental conditions such as on research ships or in polar regions. With this technology, a concentration of about one atom per cubic centimeter is sufficient for temperature and wind measurements at 100 km distance, which is an altitude where the atmospheric pressure is so low than only rockets can access this altitude. There are several aspects to improving the measurements in this project. The first is suppressing the background noise by having an extremely small field of view for high resolution, optical filtering and small field of views. This means that the laser has to be stabilized in the field of view as well as all filters. The laser itself require a complex and fast real-time stabilization system with nanosecond timing. This is controlled by the Spectrum M2i.6012-exp 20 MS/s AWG and fires at 500 pulses a second for 24 hours a day. The signals from the backscattered light are processed by the Spectrum M4i.4421x-8 250 MS/s 16 bit digitizer. The conditions within the laser are measured with a M4i.2221-8 2.5 GS/s 8 bit digitizer card. The system handles more than 1 GByte/sec for 24 hours a day with a response time of about 1 ms after processing the measured data in real-time. In total, 21 signals are managed by a software package developed at the IAP. The sensitivity and portability of this new, highly compact device is enabling new temperature data to be obtained with unprecedented resolution and accuracy in remote places. “Our measurements have already had a big impact on our understanding of the atmosphere and, what’s really exciting, is that we have proven that we can design a system that is reliable, lightweight, compact and efficient enough for future space missions,” concluded Dr. Höffner.